Malawi has been under chronic food insecurity for decades, and the government has continued to implement various policy to addresses the severity of food insecurity in the country. However, since its inception in 2005, Farm Input Subsidy Program (FISP) remain the dominant policy in the discourse around agriculture and food security. However, there have been an ongoing competing debate on failure and success FISP, and as result too controversial to be a model to recommend for other African countries that seek to increase crop productivity and reduce food insecurity in their attempt to tackle poverty. With a different approach from previous study on policy evaluation of the impact of FISP on food security in Malawi, this study adopted the ‘What’s the Problem Represent to be?’ (WPR) approach to reveal how the policymakers conceptualised the problem of food insecurity and the hidden variables that shape the representation of the food insecurity in policy response. Data collection rely mostly on secondary sources and some level of primary data to sources were also adopted. The findings of the study is that in Malawi, the meaning of food security is availability of maize, therefore FISP was designed to address maize availability only. In Malawi, “maize is life” and maize is connected to everything even to elections and politics on the one hand. On the other hand, maize is also malnutrition because the Malawian diet lack nutritional balance diet due to excessive consumption of maize among the poor farmers. 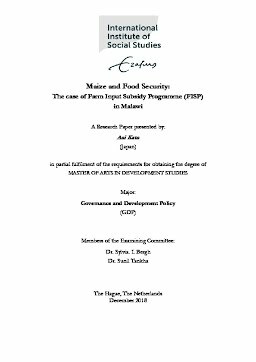 The conclusion is that going by food security in Malawi context, FISP is not doing badly but if we want to assess FISP with the four pillar of food security, it is not a model that is useful for other African countries to emulate in addressing food insecurity without careful analysis. Thesis Advisor Bergh, Sylvia. I.